Strays are always accepted here at the shelter either through our front desk from 11am to 6pm or in our Night Receiving area to the West of the main entrance while we are closed. Finders can stop at our front desk and fill out a short intake form stating where they found the animal and we handle the rest! Finders can also let us know at that time if they are interested in adopting the animal they found. We add your name and number to the animal's file and if not claimed by their owner, you will be notified after the animal has been evaluated by our kennel and veterinary staff. We cannot release any information about the animal to you. 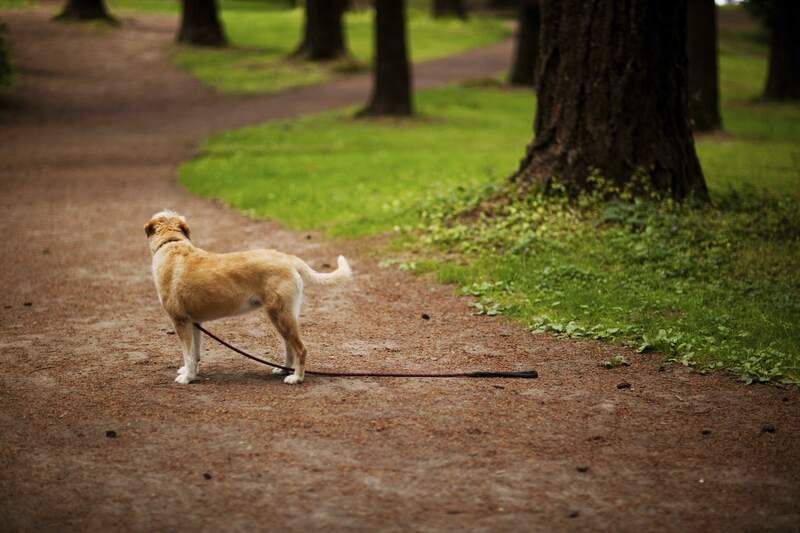 Sioux Falls and all surrounding counties require, by ordinance, that all stray animals are turned into proper authorities such as animal control or the local shelter. When a stray animal comes to our shelter or is picked up by Animal Control, the animal is then placed on hold to allow time for an owner to come forward. Holds on stray animals are determined by your local city officials and are not set by SFAHS. Please see or contact your local city official website to see stray wait hold times or for any issues. SFAHS keeps active lost report files to do our best to match descriptions with animals as they come in. We also check the animals for microchips and tag information to try to locate an owner. We suggest that you also post photos of the animal on social media channels to help us locate the owner, but do not keep the animal in your care. The owner may have come looking for their animal at the shelter, and cannot find it if you have it in your care. If you have any other questions, feel free to call our adoption center or email us. Notify neighbors and friends. Make sure you send them a recent photo of your pet with a physical description, including any tags or collars. File a Lost Report. Call Sioux Falls Animal Control (605-367-7000) or your local Sheriff's non-emergency number AND call the SFAHS (605-338-4441) to file a lost report with BOTH places. You can also fill out a lost report for the SFAHS directly from our website so you can immediately upload photos. Lost reports with recent, clear photos are 3x more successful than lost reports with no photos. Click here to file an online lost report with SFAHS. Check Local Vet Clinics. Call local vet clinics to see if any animals have been brought in that match your animal's description. Microchipped? 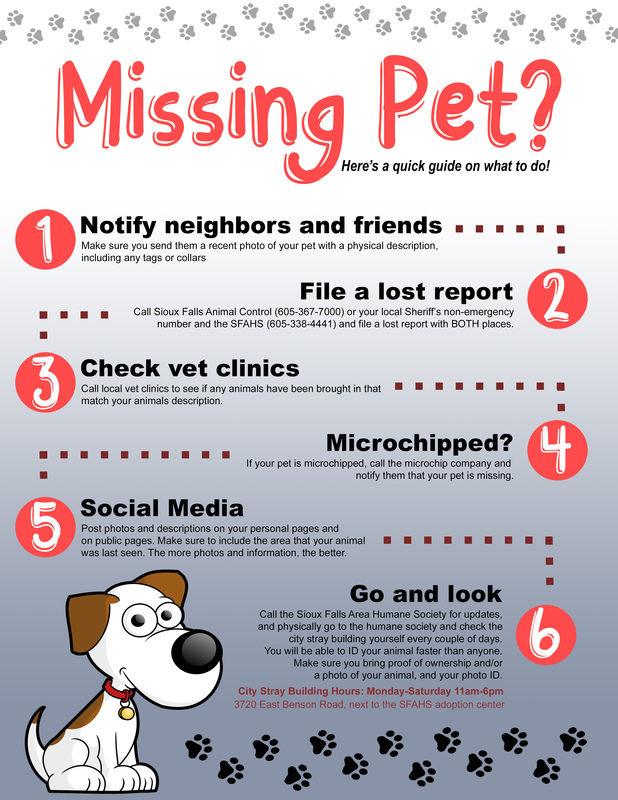 If your pet is microchipped, call the microchip company and notify them that your pet is missing. Social Media. Post photos and descriptions on your personal pages and on public pages. Make sure to include the area that your animal was last seen and a photo. The more photos and information, the better. Go and Look. Call the Sioux Falls Area Humane Society for updates and physically go to the SFAHS AND the city stray building next to SFAHS to look for yourself every couple of days. You will be able to ID your animal faster than anyone. Make sure you bring proof of ownership and/or a photo of your animal and your photo ID. SFAHS and Animal Control can see upwards of 400 pets a week depending on the time of year, and there can be over 100 lost reports at a time. We do our best to ensure our staff is checking the lost reports every single day and attempt to match them with any of the animals at our facility when a stray animal comes in or when a new report is filed. The more information the better and lost reports with photos are 3x more success than those without. We ask that you be proactive in the search for your missing pet to help us help you in having a happy reunion. It is the sole responsibility of you, the owner, to call back to check if your animal has been found. It is strongly encouraged to visit the shelter's stray kennels as often as possible. The SFAHS takes this lost report as a courtesy and will keep it on file for two weeks. If we have not heard from you that your animal is still missing, we will archive the listing as no longer active. If we have heard from you, we will keep the listing as actively missing. However, because of the large number of animals that pass through the shelter the SFAHS cannot guarantee matching a lost animal coming to its facility.